Having grown up in snowy Minnesota, ice skating and hockey games were a common winter past time. I remember friends coming down from Canada with their hockey teams to compete in local tournaments. It was always fun watching their expert skating and amateur fighting. It is definitely my favorite sport to watch in person. We were a bit surprised to find when we moved to Pensacola that there was a semi pro hockey team that played in the convention center by us. 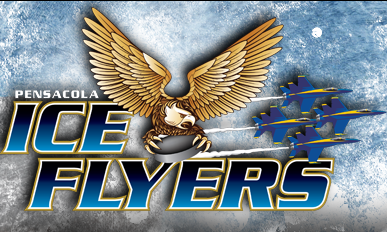 What fun we have had going to the Ice Flyers games! I attended a hockey game the night before EJ was born, and she has attended them since she was just a little thing so I guess it's no surprise that she enjoys the noise and excitement of the sport. EJ has learned how to jump off the ground recently and she put that jumping to use as she cheered.